When it was first rumoured that WFB may be getting a face lift as a skirmish game I got genuinely excited about it, I'm a child of the 80s and got into gaming pretty early so I have fond memories of rogue trader and Realms of Chaos. So for the first time in 10 years I kept an eye on GW rumours. Leaping forwards several months and AoS is released, massive lore change, new miniatures and a new system. I was initially disappointed GW didn't push out a really groundbreaking skirmish system, there are plenty of good systems about already and I really hoped that GW could do something amazing and move away from their to hit, to wound, save formula. After a couple of weeks, an intro game and watching several youtube batreps with the new rules I decided to throw myself into it and pick up the starter, then several more miniatures, then I cleared out some old OOP stuff and bought even more. I've played more AoS in the past few months than I've played wargames probably over the past year if not 2, it's pretty good. There are a few ambiguous rules, plenty of scope for taking the piss but as a small battle/large skirmish system it really floats my boat. The new Hero phase adds a lot to the game and the combat phase makes for some difficult decisions. Sometime later I've circled back round to where I started and fancied running a bit of good old Realm of Chaos warband games. Luckily for my my ever patient Brother fancied a bit of that too and so we set off on our path to glory. I spent the last week putting together warband creation rules and converting a lot of the flavour of Realms of Chaos into AoS rules, with over 25 pages of tables and the need for plenty of dice I have a fairly reasonable system ready. I've just got to flesh out some of the post match stuff. With phones in hand, and a pile of dice, Phyllion and I rolled up our starting warbands last night. The system is fairly easy going, you roll up your champion race and profile, add on weapon options, then a Chaos Attribute, Physical Attribute and Chaos Gift plus any spells etc you may get. Then take 5 rolls on the warband table discarding 2 rolls. With that you're left with a champion and 3 units with a maximum of 30 wounds to spread over them, champions, standards and musicians cost 1 additional wound to take. This seemed a fairly sensible way of limiting the warband mismatches and allowing some tailoring to miniatures you wanted to buy or convert. Khorne Champions are bloodcrazed, you can add 1 to all hit rolls made by this model. 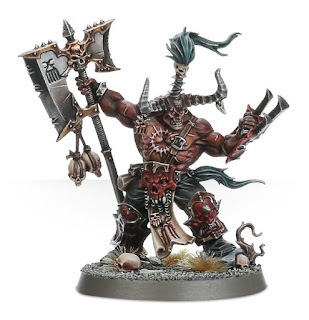 The blessing of Khorne turns one of the champion’s limbs red with might. One attack made by the champion each combat phase gains D3 damage to its profile. Calling upon the dark magics imbued into the weapons of his kin the priest calls forth the very power chaos into every strike. Roll a dice, on a roll of a 3 or more the chaos runes on the warriors weapons glow with unearthly power. Until your next hero phase, increase the rend characteristic of the units weapons by 1. Roll a dice, if the result is a 4 or higher, the prayer is answered, on a Roll of a 1 the priest is seen as unworthy and suffers a mortal wound. Pick an enemy unit within 12”. That unit suffers D6 mortal wounds, its warriors screeching in agony as superheated blood jets from their bodies. Ghalen, was once a holyman from a small hill tribes from the great northern hills in Ghur and worshipper of the great beast that slumbered. Under the constant threat of attacks by Orruk and Ogur warbands the nomadic tribe travelled endlessly on the backs of great beasts of burden. Following a vicious attack Ghalen fled from the village and into the Darkthorne Woods, after several days stumbling through the dangerous undergrowth he stumbled upon a clearing which contained a great stone monolith. As he approached the icon he was beset by a band of Goatheaded beasts, in a blind rage he managed to kill several of them and as he stood blood dripping down his face, waiting for the next attack the grove rumbled to life, a red glow eminated form the stone monolith embracing Ghalen filling him with vigur and hatred. 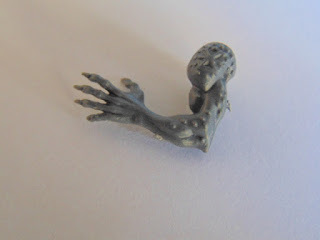 Hefting one of the creatures axes he lay into them taking head after head until only a handful remained. Embracing his as their champion, Ghalen had found a new god and his first followers, thus began his path to glory. During a skirmish in Shadyhollow Ghalen slew the Orruk chieftain Uzgub, whilst chanting battlecrys in the dark tongue he found his enemies fall to the ground as boiling blood erupted from their bodies, and thus Khorne was pleased and gifted Ghalen with a great rune of Khorne, new followers flocked to join him, powerful armoured warriors loyal to his lord. 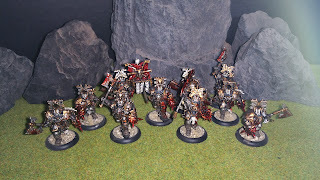 Durring a grulling pitched battle through the Ironshard hills he encountered a flock of carrion deamons, bending them to his will his warband again swelled in number. Khorne gifted him with a bestial face and cloven hooves in recognition of his triumphs. On the shores of the rust river the warband slaughtered an entire village leaving the river awash with corpses and red with blood, Ghalen, injured in the battle found his left arm knit back together, his skin turning red and thrummed with power. And that's where he is today, travelling the realms gathering skulls for his master. 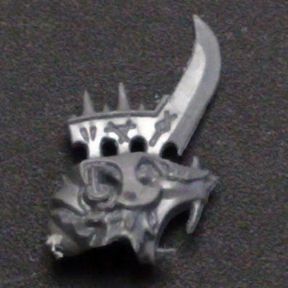 I've decided to use the Aspiring Deathbringer for Ghalen himself rather than the new slaughterpriest miniature, mainly as he's not holding onto his weapon with both hand which will make future conversions easier. To represent his bestial face I'm going with a stormvermin champion head as it looked appropriately vicious. The cloven hooves I'll just model on with some greenstuff and that's probably it to begin with, I don't want to over model him at the moment as there will be plenty of time for more attributes or gifts. And the bestigor will be converted from some beastmen I already have, adding double handed weapons from the Bloodreaver box, bit's of additional armour, some daemonic tails and a few horn modifications. I really like the fact the wings replace the arms on these guys rather than in addition to, makes them appear more animal like to me. So that's it, I'm sure my brother will blog his warband as it's gets built, we're aiming for a first game around Christmas to test it out properly, no doubt I'll try and rope some local gamers into it too. What a fantastic post! At last someone who is being positive about AoS. Its a great game and now after reading your approach I may be tempted by the starter set. My son (who is 12) and I had a game tonight using Bretonnians and Dwarves, simple, fun and a decent game. Thanks for posting this your way of building your forces seems very interesting....the only downside is the lack of a points system-even my son mentioned that tonight! Warhammer came from an era where games were not fair, the original realms of chaos rules could pitch wildly uneven forces against each other. But it was done in the name of a narrative, if you take a look at some of my pulp or napoleonic posts I've long gamed without points, my brother and I love telling stories over an arc of games, the results of one game affecting the next. The pleasure is in how the story overall turns out not the results of a single game. I'll be posting the force creation rules later this week hopefully, I still have the campaign rules to work up yet. But it would be great for other people to pick them up and have a play around with them.